Motorists can expect the following lane closures over the next several weeks. Uniformed police officers may be onsite to assist with the closures if needed. SH 146 southbound outside lane at the NASA Parkway intersection will be closed April 10 through April 13 from 9:00 a.m. to 3:00 p.m. each day. This closure is to create a work zone for demolition activities. 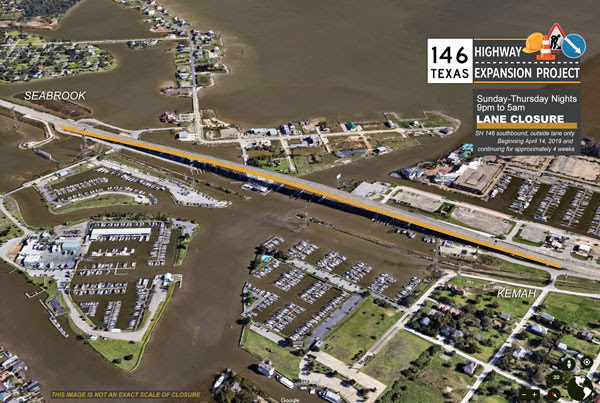 SH 146 southbound outside lane on the Clear Creek Channel Bridge (Seabrook/Kemah Bridge) will be closed every Sunday through Thursday night from 9:00 p.m. to 5:00 a.m. each night beginning on April 14 and continuing for approximately four weeks (weather permitting). Please take note of upcoming impacts to the Clear Creek Channel navigable waterway under the (Seabrook/Kemah Bridge). The closures listed below have been approved by TxDOT and the U.S. Coast Guard and are necessary for the construction of the SH146 expansion project. 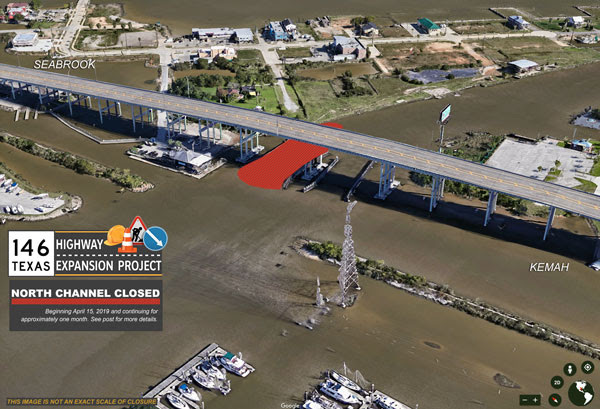 The north (inbound) channel, directly under the Clear Creek Channel Bridge (Seabrook/Kemah Bridge), will be completely closed beginning at 8:00 a.m. on Monday, April 15, 2019. This closure will be in place continuously for approximately one month. This closure will allow the contractor to remove the existing fender system so they can begin constructing new bridge foundations. The south (outbound channel) will not be obstructed by other work on the SH146 project while this closure is in place. Please be advised that the south (outbound) channel will have two-way traffic during this time. Message boards have been placed on both approaches to the channel to assist with notifying approaching vessels. The south (outbound) channel, directly under the Clear Creek Channel Bridge (Seabrook/Kemah Bridge), will be completely closed beginning immediately after the previous north (inbound) channel closure is removed. This closure will be in place continuously for approximately one and a half months. This closure will allow the contractor to remove the existing fender system and begin driving concrete piles for new bridge foundations. Additional notifications will be posted and sent once the specific start date for this closure is known. Additional closures, including short-term (12 hours to 48 hours depending on approval) full closures will continue to take place throughout the SH146 project as both sides of the existing bridge are widened and a new express bridge is constructed. Notifications will be sent prior to future closures. This SH 146 Update was provided by the Texas Department of Transportation (TxDOT) and MAY BE SUBJECT TO CHANGE. Information about the SH 146 Expansion can be found at www.sh146.com.